"My books are illustrated with primary source electron micrographs and space photography." "I have learned through many author appearances that children are inspired and motivated by exciting scientific imagery." instaSTEM turns STEM into STEAM! ...the "a" is for ART! students to learn, read, and write about science. Look closely at a photo and discover scientific information. The "Art of Science" motivates students to explore and discover. InstaSTEM gets students outside where they explore and discover the natural world while creating photographs. Back in the classroom they research and write about their images, and share them on the class website. 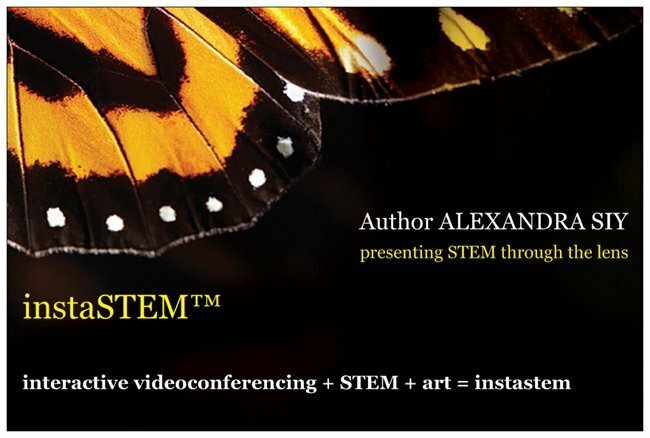 InstaSTEM is for students in grades four through twelve! 1. Students meet with me in my FIELD TRIP ZOOM classroom for an interactive videoconference (IVC) during which I show scientific images from my books. We discuss scale, content, composition, and captions. 2. The teacher and students discuss science themes, such as botany, zoology, entomology, meteorology, geology, hydrology, mechanics, engineering design, or any topic that can be photographed. They decide the focus of their project and read nonfiction for background information. Students may use any kind of digital camera --cell phone cameras are great. 3. During our second IVC we discuss photographic techniques used for creating artistic images such as light, composition, scale, location, and editing. Students have at least a week to take photos during class or as a homework assignment. Students upload photos to the class website. 4. During our third IVC we analyze the images and choose pictures that are both artistic and scientifically interesting. Students learn how to write an information rich caption. Then, each student chooses one photo to research in depth. Students research and write an information rich caption. 5. During our final IVC we view the images and discuss the captions . The students can use their images and captions to create an art show, a book, or as inspiration for a longer research and writing project.